Printed with whimsical wine-inspired definitions, these glasses make for great conversation between sips. At her parties, captivating conversation was always on the menu. Eliza Todd's definition-adorned glasses saw to that. The mixed media artist searched antique dictionaries for colorful vocabulary related to sipping from the vine, which is printed on these stemless glasses in a typewriter font that evokes a sense of old world charm. Offering a touch of tongue-in-cheek humor, they make great conversation pieces for your wine-loving guests. Glassware made in the USA; decorated in Lawrence, Kansas. 1. A drink, as in wine, that is consumed to the last bit. 1. An avid consumer of wine. 1. To yield grapes or to have vines. 1. An insatiable affection for wine. Check out the Life By Definition Beer Glasses and Life By Definition Whiskey Glasses. We chatted with Eliza about how she took the plunge from working in the computer industry to full-time artist, thanks to her weird and wonderful antiquated words. See the whole story on our blog. Chicago-based mixed media artist and graphic designer Eliza Todd has been producing art for as long as she can remember. A strong believer that every soul craves creativity, she is always looking for new ways to tell a story. When she was searching for a single word to help describe one of her art projects, her research led her to the word "efflorescence," which means "the process of unfolding, as if coming into flower." This simple discovery inspired her to unearth more antiquated and lesser-known words in order provide deeper meaning and symbolism to her work. She now considers herself a collector of words and uses their meanings to start and expand on new projects. 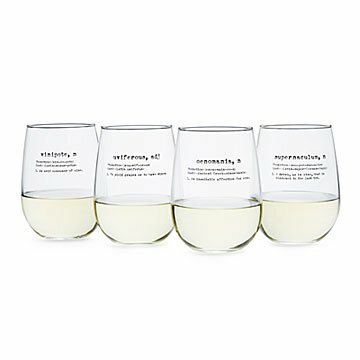 I like the humor and uniqueness of the wine glasses and I'm sure our friends will love them. I love shopping Uncommon Goods for those unique, one of a kind gifts. She loved the glasses but I have to say I was a bit disappointed in the quality of the type. It looked as though it might wash away with the first washing. Fun present! Definitely something you probably wouldn't buy for yourself, although, after seeing how cute they are, I'm contemplating it! Once again Ungommon Ggoods deliver! The glass set was a birthday gift for a dear friend who is hard to buy for and she loved them! Good to use on all occasions - every day, birthdays, holidays - both with family and friends.